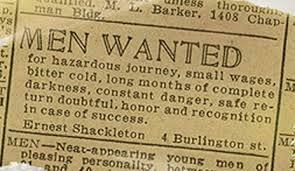 Or it may describe RVing at times. Dropping this info here in case I need to search it out later. The 2019 summer planning has begun; threads are popping up about traveling in eastern Canada, including Nova Scotia. I knew that the Province was declining to enforce its well-known categorical exclusion (i.e., total ban) on "RV overnight parking" (boondocking) but it wasn't until today that I found a reference formalizing the policy that I had observed to be enacted. Just found this thread and read whole thing. Had to smile. I grew up in the Texas hill country. I have found no one anywhere understands driving distances like IB's blog mentioned from Texas to Canada except Texans. I drove back and forth every 2 months from Ohio to South Carolina (720) miles with 1 pit stop in a mini-van from 2009 until July 2017 when I moved to SC full time. As a physician, my biggest fear was DVT so I would tank up on Aspirin about 3 days before I made the trip. I never recommended that anyone travel like that! Now that I am retired with the interstate, I will never travel like that again. But I've learned quickly that its not always easy to find a place to stop when I prefer to stop, which is about 300-350 miles. I now have cracker barrel, harvest host, passport America, KOA, etc.to reference. I had no idea it had gotten so difficult to find spots in Texas. Growing up, we went to Garner park on whims and camped with no reservations. My parents have property in the hill country and installed a 30 amp hook up for me. An RV park just went up about 5 miles from their property and I thought "who would want to stay there? ", but there were campers there, not full last May, but it was brand new....I'll check it out again this year. So now I will discuss with my brother converting my parents property to an RV park when they pass because I had no idea it was such a high demand. Good info, thanks again. So much has changed in the 3 years since I hatched this thread - both in our lives, and in the industry. From my post #14 in this thread: "Hubster and I had our solar system epiphany two weeks ago when I had to rearrange a work junket because I couldn't get a commercial reservation for the Interstate [a hook-up reservation was needed because the van had zero off-grid capability at that time]. .....We realized at that point that we just had to push through and get the solar finished." We did, indeed, push through and get the solar finished. AND the entire rest of the electrical system too, including a lithium conversion. AND then developed an off-grid property in Canada for our rig (put in a private road and parking pad). And along the way, boondocked in some of the worst-conceivable places, and some of the best-conceivable places. Here's one of the latter. 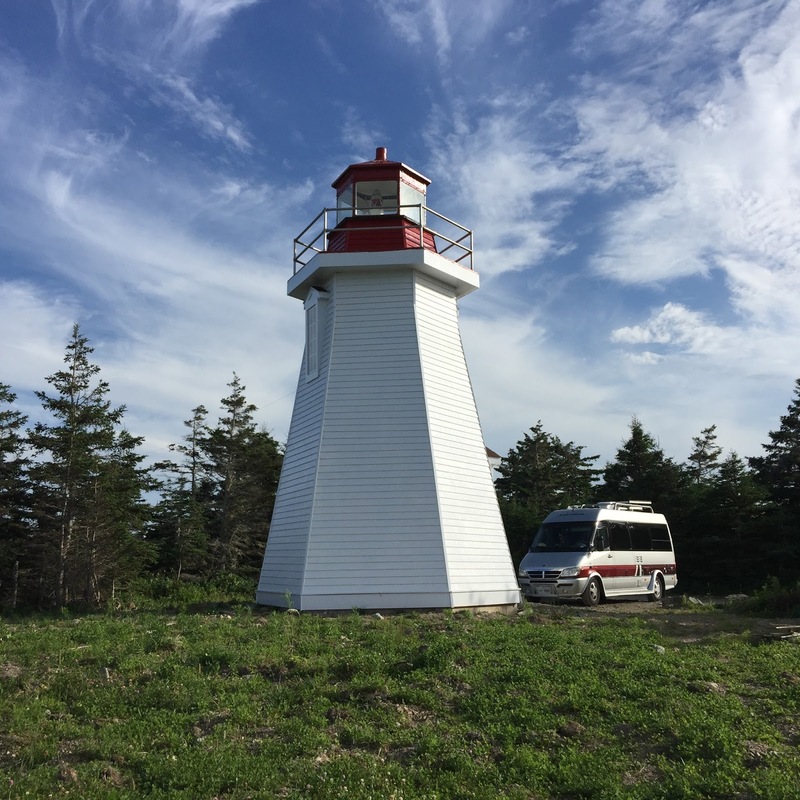 This pic is one of my favorites in part because the 125-year-old lighthouse's top stripe is the same garnet color as the stripe on our van. I love that picture and the freedom it represents!!!!! BUGBUNNY +1 btw, is it just me or does that lighthouse make my AS look small? I'm in my mid-50's. Neither lighthouse nor anything else will make my AS look small. This forum looks prettier on an iPad. NASA upped its security protocols and my husband stopped using his, so I commandeered it. I have long considered iPad an instrument of Satan. It's designed primarily for content consumption, not creation. As if, in our slothful society, we need yet another device that prioritizes the wrong one over the other. I must admit though... all the pictures look better than on a phone. I will let you all in on our secret; our most frequent destination is bike trails. We have been boondocked at many a bike trailhead without an issue. We usually get a drive-by during the night by local law-enforcement, but never got a knock on the door. I guess the rack of bikes on the back tells them we’re there on business. Most of these bike trail destinations are in small towns. Quiet. 3BCAMPER - Uh-oh, I wish you had not given away our cyclist secret (Just kidding) Yes, it definitely helps to have the right equipment (empty bike rack and loaded one). A lot of the trails in our neck of the woods are open round-the-clock. It is not unusual to have multi-day racers/riders be out on the trail at weird hours training. So an empty bike rack means they're still out on the trails night riding. A fully loaded rack means they're taking a breather, if they are out of state plates, usually means they are out to hit the trails 1st thing in the morning. It would be a lot different if the vehicle was a sports car without a bike rack. In fact when we go to bike events & races, we do that all the time and never had issues with our regular van or the AI provided we are close by to where the race is happening the next day. Good to know. I travel with my bike too, on a rack on the back. HMMMMM.... this could be a valuable type of thing, IF you can find it in your city. I have zero objections to paying for parking on a 24-hour basis. Zero. 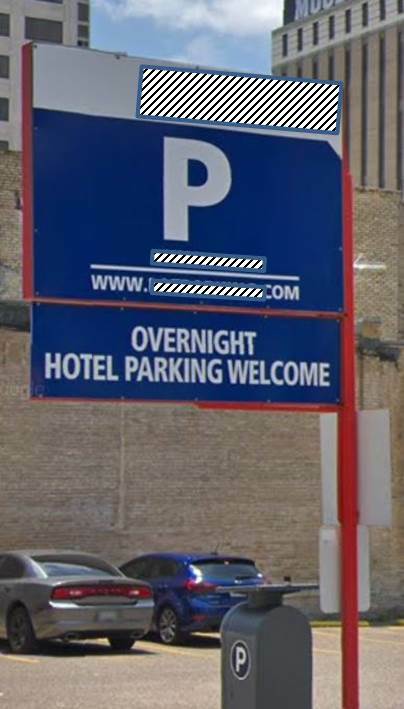 The problem is that, in Texas, most pay lot owners prohibit overnight parking for perceived liability reasons. This is an example of a surface parking lot that encourages it. They are a third party so they don't know if you are actually staying in that nearby hotel or not (as far as I can tell). All they care about is that their meter gets fed. Which I wish were true everywhere because it would make my life a lot easier. Today I offer you this Ode to Slow Learning. Or, from another metaphorical perspective, to a hammer, everything looks like a nail. To an investor, every square inch of urban property looks like a money-maker, no matter how unconventional it may be. 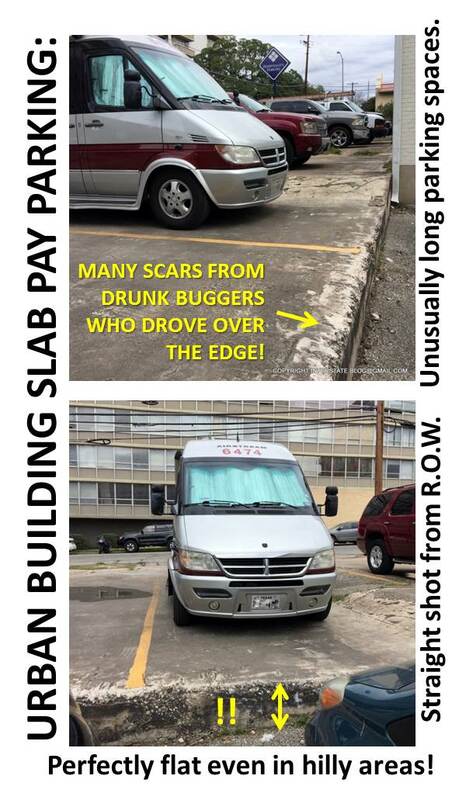 I did not notice until this past week the prevalence of scraped slabs in the urban cores of Texas cities. The first wave of development a hundred-ish years ago resulted in small, inefficient buildings. Most of those were later razed to make way for more intensive development. But if the original tracts were small and unable to be incorporated into larger projects (e.g., if adjacent landowners would not sell), they basically get scraped, patched, and put into service as portions of pay parking lots. Washington DC , Washington, D.C.
One strategy I have used is for specific hotel parking lots. That is knowing what is the hotel's normal staffing and ability to enforce who is parked. 1. Normal sized Hampton Inns and Courtyard Marriotts as an example rarely employ security which is left to normal front desk staff to take care of. As a result no one ever really pays attention to who is parked in the lot. A 22 year old college student manning the front desk at night is hardly worried about the van parked in one of their spots. Clearly using common sense while parked there is good. Short overnights, no generator, don't extend your awning and lounge outside, lol. 2. On the flip side do NOT try it at larger full service hotels like Hyatt or Marriott. They have full-time security patrolling the lots 24/7 and will bang on the door. Although a friend did manage a parking lot at the Fairmont Lake Louise in Canada and was even so bold as to go in to the lobby each morning for free coffee and to use the bathrooms, lol.